Human rights research costs money. 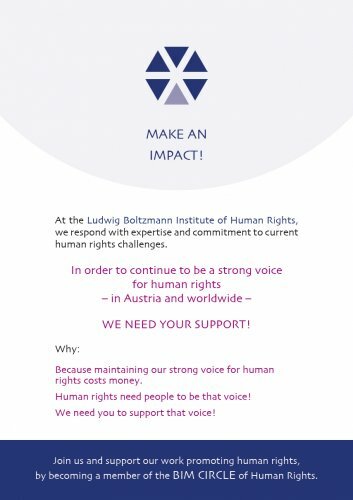 By donating now, create impact and secure human rights research in Austria, Europe and all over the world. The BIM establishes a network of supporters, in order to ensure sustainable and independent human rights research also in the future. With the aim of ameliorating the living conditions of persecuted or discriminated persons. * The Ludwig Boltzmann Institute of Human Rights - Research Association (Ludwig Boltzmann Institut für Menschenrechte – Forschungsverein) and the Ludwig Boltzmann Association are the legal entities of the BIM. You are hosting a human rights relevant event and want to donate part of the entrance fees to the BIM? 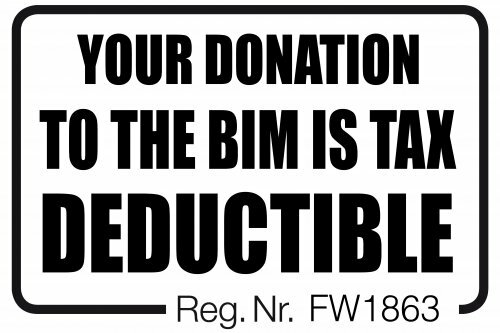 You are celebrating an anniversary and want to ask your guests for donations in favour of the BIM instead of gifts? Please contact Anna Müller-Funk (anna.mueller-funk@univie.ac.at, +43/1/4277-36104). Do you want to make a visible social commitment with this years’ Christmas donation? Please contact Patricia Hladschik (patricia.hladschik@univie.ac.at, +43/1 /42 77-27426). Would you like to strengthen human rights with your legacy for a charitable purpose? Please contact Patricia Hladschik (patricia.hladschik@univie.ac.at, +43/1 /42 77-27426). More information on the "good will" can be found here. Your donations are tax deductible (from wage tax as special expense or from income tax ​​as business expense). The Ludwig Boltzmann Institute of Human Rights (BIM-FV) is on the governmental list of organisations which are registered for tax deductibility. We will be happy to make your donation visible on our website.